There are countless people who’re addicted to the Internet and social media, namely Facebook. It has affected the daily lives of so many that Internet Addiction Disorder is being argued about to be a real psychological disorder. Signs of Facebook addiction include having a constant need to be on Facebook and investing more time on a website than active socializing. There’s a Facebook Addiction Test that you can take if you think that you may suffer from FAD. If it turns out that you are afflicted, you might want to seek professional help, but there are things you can do on your own that might improve your productivity. The first step with any addiction is to admit that you have one. If you don’t truly believe that you have a problem, you will not take the right steps to combat the illness. It’s very important that you recognize your illness and verbally admit it in order to help yourself succeed. 2. Give yourself time limits. 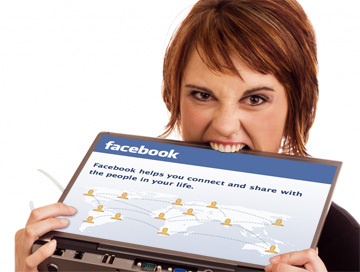 The best way to start combating Facebook addiction is to start limiting the amount of time you can spend on the site. It’s a good idea to first pay attention to the amount of time you currently spend on the site and continue to decrease from there. For example, if you’re spending 8 hours a day on Facebook, you may want to take a week and cut back to 7 hours, and then 6 hours the next week, and so on until you’re down to about 1 hour per day. 3. Cut down your number of friends. Part of the addiction is wanting to know what is going on in everyone’s lives, but some people are just not important enough and are causing the problem. Go through your friend list at least once every week and start removing people that you truly don’t talk to on a regular basis. By removing people from your friend list, you are cutting down on the number of notifications you’ll receive in your news feed, and if your news feed doesn’t update regularly with new items, you will not feel compelled to check it as often. Harsh as this may sound, this can be a good idea. 4. Create a free day. Every week, you need to designate yourself a Facebook-free day. This means that you cannot log onto the site at all during that day. This will allow you to spend time doing other activities that are important to you. 5. Get back into old activities. Before Facebook, you spent your time doing something else. Use this time to get back into doing the things that you used to love, whether it was playing a sport, hanging out with friends or even taking part in a hobby. The more you can distract yourself from Facebook with things you enjoy doing, the less you’ll feel like you need the social network. If you want to go cold turkey, or if you really want to combat the illness, you may want to deactivate your account altogether. If you don’t want to completely remove yourself, you can always block the site from your computer using a tool like iFreeFace. This way, you will not be able to access it until you remove the block. This can help you focus on other areas of your life without the distraction of Facebook and help you stay away from the site while you get your life back in order. Once you’ve combated the addiction, you can then decide if you want to get back on Facebook or keep it deactivated indefinitely. Kathryn Thompson is a social media expert and avid writer. She currently spends most of her time educating SEO professionals in SEOMap on ways to pinpoint the best possible keywords for their campaign. Extreme Road Trip 2: A Trip Worth Taking? Crazy it’s come to this. I myself did a Facebook detox once for a week, and it really changed things. I had so much free time, and afterwards I didn’t even want to be on it much anymore. Great tips. You are right. Giving your time a rest can help you in order to manage Facebook addiction. Sometimes, it is also good to have outdoor activity.